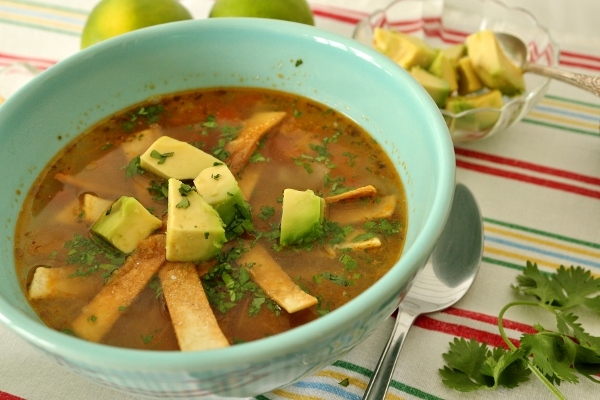 Chicken soup is the ultimate comfort soup whether it's traditional chicken noodle, Vietnamese chicken pho, Southern-inspired chicken and dumplings, Jewish matzo ball soup, Spanish soupy rice with chicken, or this Mexican sopa de lima or Yucatán-style lime soup. 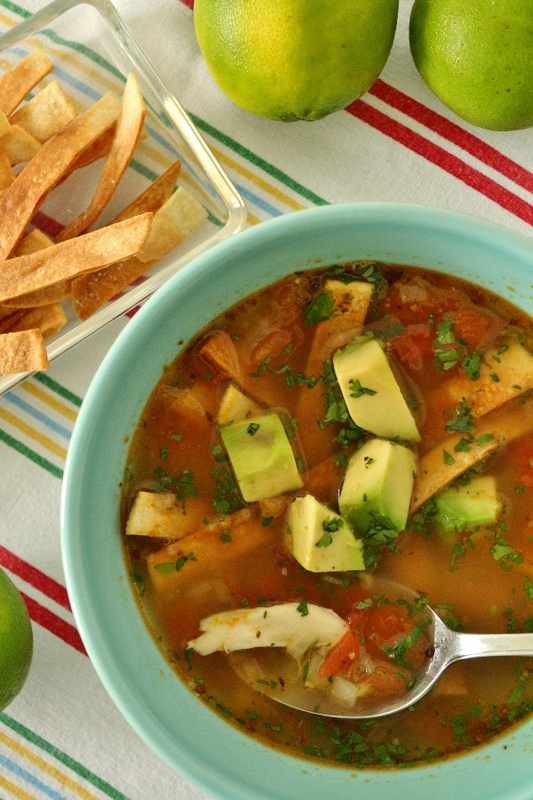 If you're looking to soothe a cold, or simply satisfy your need for comfort in a bowl, this sopa de lima is for you! 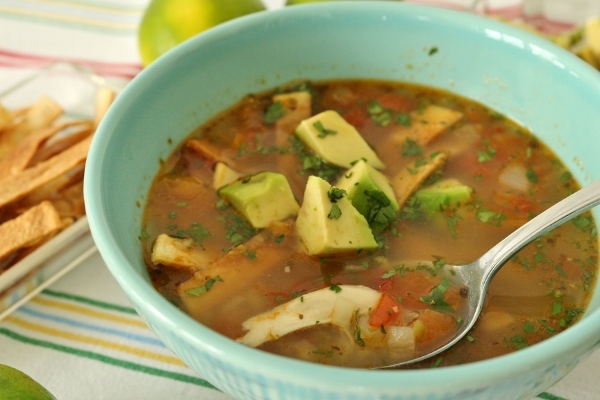 Aromatic onions and garlic provide a flavorful base to this soup, while a finely chopped jalapeño gives it a bit of heat. 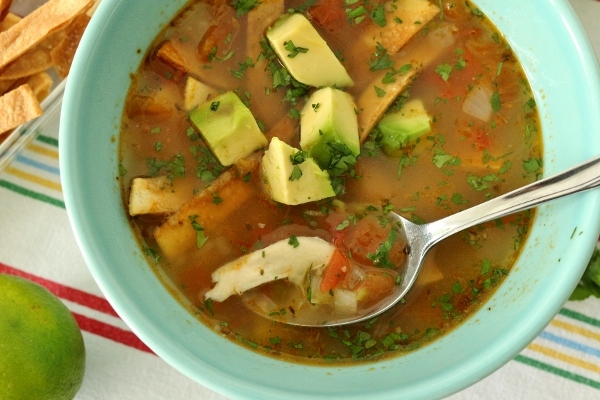 Oregano, chopped tomatoes, and lime juice round out the soup, giving it its trademark tartness, while chunks of chicken simmered in their own broth are the final touch. 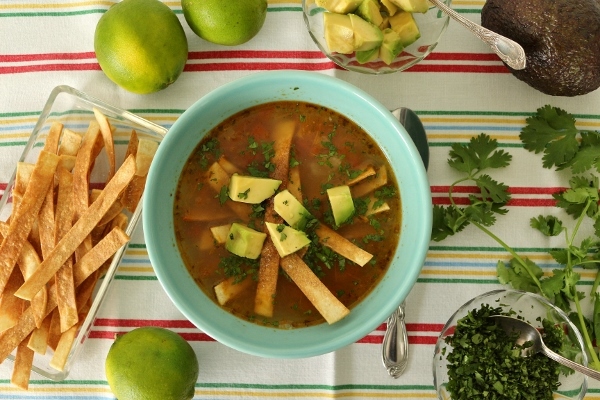 While the soup is excellent as is, you'll definitely want to garnish it with crispy fried tortilla strips. 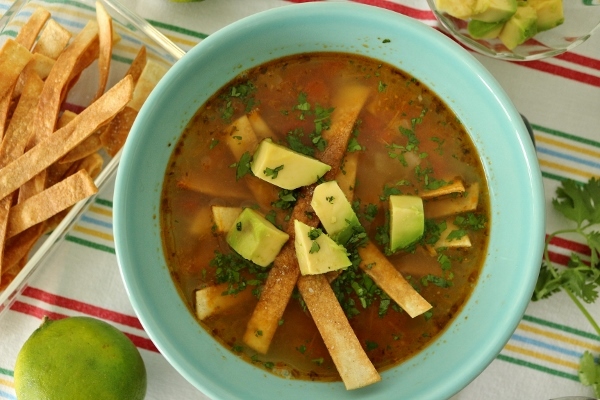 You will probably end up with way more tortilla strips than you really need to garnish this soup, but they are delicious for snacking, so by all means make the full amount! 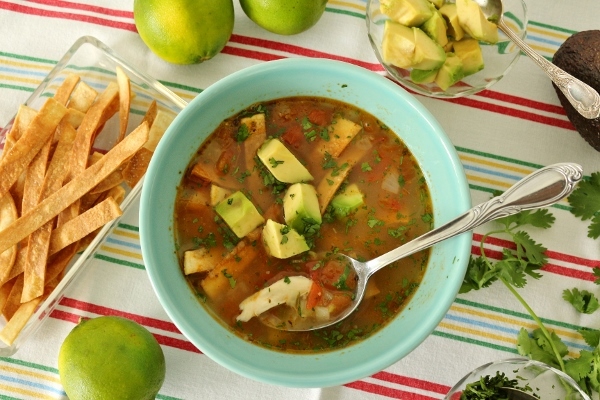 You may also garnish this sopa de lima with a chopped poblano chile, finely chopped cilantro, cubed avocado, Cotija cheese, and lime wedges, but you certainly don't need to use all of them if you'd prefer not to. I stuck with cilantro and avocado for mine. The recipe states that it serves 6, however for this amount of soup I think you're more likely to serve 3 to 4 at the most. You can easily double this recipe if you'd like more leftovers or if you are planning to serve a crowd. I love soup year round, so even though it's technically summer, you know there are rainy days ahead, and there's nothing quite like a bowl of comforting, steaming-hot soup on a rainy day to wash away the blues. To make the tortilla strips: In a medium skillet over medium-high heat, add enough canola oil to reach a depth of 1/2 inch and heat until a small piece of tortilla or a speck of salt immediately sizzles on contact. Cook the tortillas, one at a time, for 1 to 2 minutes on each side, or until golden brown and slightly puffed. Using tongs, transfer the tortillas to paper towels to drain; sprinkle with salt. To make the soup: In a large stockpot over low heat, warm the olive oil. Add the onion and garlic and cook for 10 minutes. Season with salt and pepper, stir in the jalapeño, and cook for another 2 minutes. Stir in the tomatoes and oregano and cook for 5 minutes more. Turn the heat to high, add the chicken stock, and bring to a boil. Turn the heat to low, cover, and cook for 30 minutes. Add the chicken and cook for another 5 minutes.